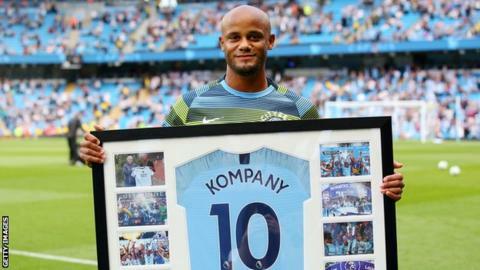 Manchester City captain Vincent Kompany will donate all profits from his testimonial match to the city’s homeless. This season marks the 32-year-old’s 10th year at City and will culminate in a testimonial match in August 2019. The Belgium defender has also set up ‘Tackle4MCR’ with Greater Manchester mayor Andy Burnham in a bid to inspire social change in the region. “I’ve received much from Manchester,” said Kompany. “Over the past decade I’ve been lucky to have witnessed and played a part in Manchester City’s rise as a club and a brand. This has also run parallel alongside the rise of a whole region. All profits from the match – to be held at the Etihad Stadium at the end of the current Premier League season – will be donated to the Homelessness Fund set up by Burnham, which aims to end homelessness in Manchester by 2020. Tackle4MCR will raise money throughout the season through several fundraising initiatives, and hopes to ensure every rough sleeper in the city has a bed every night of the upcoming winter. “What inspired me so much about this region, about this city, is the positivity of the people that live in it,” said Kompany, who says he was “made” in Manchester. Burnham, who donates 15% of his salary to the Homelessness Fund, added: “In his famous poem, Tony Walsh told us that ‘some are born here, some drawn here, but all call it home’.